In his year-end review titled, “Gas Industry Looks Optimistically at 2017,” PointLogic author Kevin Adler quotes our COO, Jim McDonnell. Scroll down to the bottom of the report which you can find here. In our May 20, 2015 article, we wrote that “Concerns and worry about Peak Oil are overstated and irrelevant.” The article concluded, “With crude oil supplies increasing and the demand for crude oil slowing, and likely to continue to slow more, demand for crude oil will peak long before dwindling supplies of crude oil become a concern.” Read the full Avalon Energy Peak Oil article here. Yesterday, eighteen months later, the Wall Street Journal reported that major and state-owned oil companies are beginning to plan for the “mind-bending scenario” when global oil consumption crests and begins a permanent decline. In response to this “peak oil demand,” these companies are beginning to increase their investments in petrochemicals, natural gas, cost reduction and alternative energy sources like solar and biofuels. A dramatic turn of events. Predictable, but dramatic nonetheless. Reference – “Oil Firms Anticipate Day of Reckoning,” The Wall Street Journal, November 28, 2016. The Avalon Advantage – Visit our website at www.AvalonEnergy.US, or call us at 888-484-8096. Our last blog post Separate Paths – Part 1 looked at how electricity distribution costs have been rising since 2008 and many of our readers have had questions about just why this is happening. In order to explore this, and to try to get some answers, I dove in and analyzed seven years’ worth of Pepco electric bills from a representative home in Pepco’s Maryland service territory. Before sharing my findings, I want to acknowledge that my base data is just from one household, which can be problematic for making generalizations. However, the kWh rates for individual charges should be representative and similar for other residences in the area over these years. I cannot account for differences in usage from one household to the next, but I believe this can shed some light on the larger shifts taking place within the utility cost structure. First, once all of the data was collected and organized I looked at the percentages of the total bills that were from electricity distribution, transmission and generation. As you can see in the charts below, a drastic transformation has taken place. In 2009 distribution charges accounted for 24.6% of the total bill, but by 2015 it makes up 41.7% of it. The portion of the bill coming from transmission charges also more than doubles during this period resulting in generation’s share to fall to just over 50% of the total bill. While generation’s portion of the bill has been falling, transmission and distribution have been on the rise since 2009. Please note Pepco’s distribution energy charges are different from their generation energy charges. Generation energy charges represent the cost of procuring energy for customers. Distribution energy charges represent the cost of providing electricity delivery services to customers. These distribution energy charges are billed on a kilowatt-hour usage basis. So, while they are referred to as “energy charges,” they do not relate to the procurement of energy, only to the delivery of energy. The customer charge is a flat rate charged once a month. Over this period, the charge has gradually risen from $6.65 to $7.39 a month. In the chart below you can see the yearly average rate for the other three primary components of distribution. 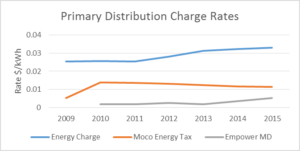 Although the Montgomery Country Energy Tax has fallen slightly since 2009, both distribution energy charge and Empower MD charge have risen. Throughout this time period the average yearly distribution energy charge has been increasing, but to get a better understanding of it on a unit rates basis, I charted them by month. Below you can see how the rate falls in the winter months and rises during the summer months. Over the seven year period, the distribution energy charge has increased, on average, about 6.8% per year. Also notable is the growing distance from peak to trough each year. After an in depth look at seven years’ worth of residential Pepco electric utility bills, the shifts in generation, transmission and especially distribution have become more clear. Although far from perfect due to a lack of access a broader set of data, I hope that this analysis has been able to provide some insight on current trends and answer some of your questions. The Avalon Advantage – Visit our website at www.AvalonEnergy.US, call us at 888-484-8096, or email us at jmcdonnell@avalonenergy.us. Please feel free to share this article. If you do, please email or post the web link. Unauthorized copying, retransmission, or republication is prohibited. Copyright 2016 by Avalon Energy® Services LLC. Since the shale boom began in earnest during 2008, natural gas prices in the US wholesale market have fallen dramatically. Prices have hovered within the 2 to 6 dollar per million Btu (mmBtu) range over the last few years, with the prompt month NYMEX natural gas contract trading at a remarkably low $1.70 mmbtu today. 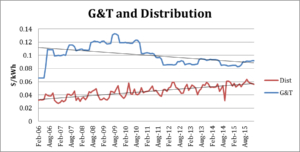 As we have been reporting for some time, wholesale electricity prices have also experienced a similarly dramatic decline, although that relationship has been weakening in recent months (see Natural Gas and Electricity Are Parting Ways – Part 1 and Natural Gas and Electricity Are Parting Ways – Part 2). Given the decline in wholesale electricity prices, many of our readers have asked us why they have not seen a similar decline in their home electricity bills. To answer this question we examined electric utility bills from a typical Maryland residence from the last 10 years and broken down the different charges included in the total cost. 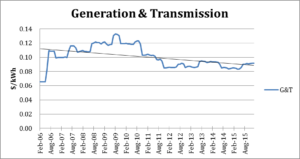 First, if you single out generation and transmission (G&T) charges during this time period, you can see in the graph below that they have been more or less in decline since the end of 2008. G&T charges represent the costs of producing electricity and of moving high voltage electricity from generation facilities to distribution lines. However, this does not give us the whole picture. Our electricity bills are not only based on G&T, but distribution costs as well. As you can see below, while generation and transmission have been declining, distribution charges have actually been rising. Distribution charges include the costs of maintaining, expanding and improving the electric system to deliver electricity from high voltage transmission system to customers, homes and businesses, as well as the utility’s depreciation expense and return on rate base. Other components of distribution costs include, but are not limited to, grid resiliency, environmental surcharges and county energy taxes. Ultimately, simultaneously falling G&T charges and rising distribution charges are to blame for the lack of change in our electric utility bills at home, even with wholesale prices so low. In the final graph you can see the total utility bill charges have remained relatively stable as a result of this gradual cost shift from G&T to distribution over the last few years. 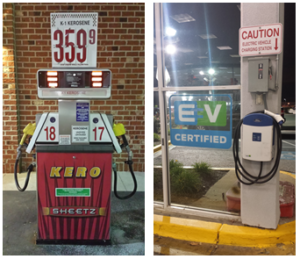 In our last article, Natural Gas and Electricity Are Parting Ways – Part 1, we explored the weakening correlation between wholesale natural gas prices and electricity prices in the Mid-Atlantic. While natural gas prices have fallen dramatically over the past seven years, and electricity prices have fallen as well, electricity prices have not fallen as far. We discussed how this weakening relationship is, in part, a result of natural gas-fired generating units more and more often being dispatched before coal-fired units. In this article, we look at the influence of capacity prices. The cost of energy delivered by a competitive supplier consists of several elements—generation, capacity, transmission, and ancillary services. Costs to suppliers resulting from PJM’s energy auctions are reflected in competitive suppliers’ generation charges. 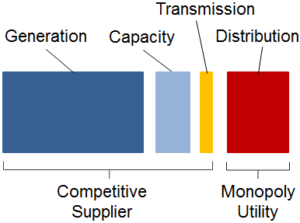 Competitive suppliers are also required to own or to reserve generation capacity. PJM runs separate capacity auctions to place a price on this capacity. These auctions establish capacity prices for each of the three consecutive future planning years. During the depths of the Polar Vortex of January 2014 (see What Does Volatility Look Like? ), there were times when more than 20% of generation capacity in PJM was unable to respond when dispatched by the grid operator. The grid operator then had to call upon non-economic (meaning more costly) resources to fill in, some of which also were unable to respond. The grid came within a few thousand megawatts of brownouts, and prices soared to more than $2,600 per megawatt hour during some hours. Clearly more reliable generation capacity was required. 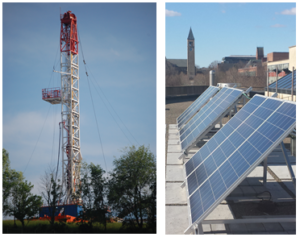 PJM proposed, and the Federal Energy Regulatory Commission (FERC) approved, a change in regulation creating a new Capacity Performance product. With Capacity Performance, PJM established new, more stringent requirements for generation regardless of weather conditions and system conditions, and also established onerous penalties in the event that generation does not respond when called. Most generators bid their capacity again during two Transitional Auctions, for the planning years 2016/2017 and 2017/2018. As a result, due to this change in regulation, capacity prices have been reset higher for each of these two planning year periods. The table above presents, for the 2016/2017 and 2017/2018 planning years, capacity prices that were originally established as part of Base Residual Auctions (BRA) and the new prices established as part of Capacity Performance (CP) Transition Auctions. Additional investment was clearly needed in order to improve system reliability. PJM’s strategy with Capacity Performance is, on the one hand, to provide generators “resources to invest in improvements in such areas as dual-fuel capability, securing firmer natural gas supplies and upgrading plant equipment,” while, on the other hand, imposing substantial penalties for non-performance. These increased costs associated with Capacity Performance, which will be reflected in electricity prices, are unassociated with changes in natural gas prices and are another driver of the decline in correlation between electricity prices and natural gas prices. In recent articles, we have explored the dramatic decline in natural gas prices over the past seven years. See These Are Days To Remember and 10,000 Maniacs Were Right. In the US Mid-Atlantic, natural gas and electricity prices have, over time, tended to move together. While there has by no means been a perfect correlation between the two, the relationship has been strong. Over the past 15 years, the coefficient of determination (R2) has averaged about 67% (see yellow line). In other words, over this time period, 2/3 of the change in electricity prices can be explained by changes in natural gas prices. More recently, however, the strength of this relationship has weakened and continues to weaken further (see red line). 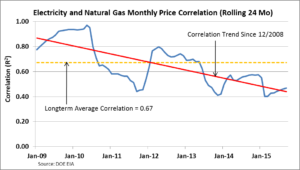 Electricity prices have declined but not as precipitously as those of natural gas. Why has this relationship weakened? Two significant drivers relate to (i) dispatch order and (ii) capacity prices. In scheduling energy to serve electricity users, the grid operator, PJM, utilizes a least-cost dispatch model. PJM develops an expectation of projected system load on an hourly basis and then seeks bids from generators to supply energy to serve this load. After bids have been submitted, for each hour, PJM accepts the lowest cost offers first and then works their way through higher price offers until sufficient supply has been cleared to match the projected load. (There are a number of system constraints and complications that must be incorporated into the process, but this pretty much captures it.) For each hour, the price at which the last megawatt-hour (MWh) clears sets the price for all the supply offers that clear in that hour. But now, low natural gas prices are leading to lower and lower supply bids by natural gas-fired generators, causing them to more frequently fall down the dispatch order and clear before coal-fired units. Because of this, coal fired units are now more often becoming the marginal, or price-setting, units. And, as a result, falling natural gas prices have not driven down electricity prices to the extent they once would have. In addition to procuring energy, electricity wholesale suppliers must also own or procure capacity. In our next article, we will look at how capacity costs influence electricity prices. 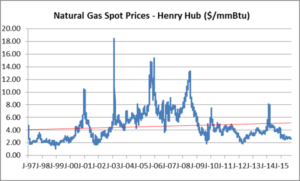 The dramatic decline of natural gas prices was the focus of our last article (These Are Days to Remember). 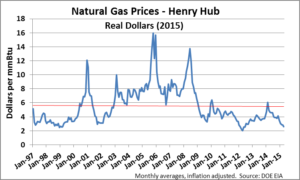 As we noted then, in real dollars, natural gas prices were near all-time lows. 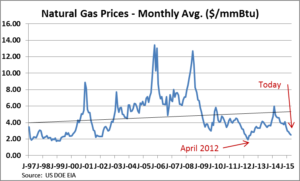 Since then, natural gas prices have continued to fall. Yesterday the November futures contract settled at $2.033 per mmBtu. The last time the November contract was this low was 17 years ago in 1998, when it closed at $1.97 per mmBtu. 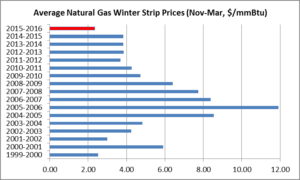 The “winter strip” is the simple average of natural gas futures prices for the five month period of November, December, January, February, and March. 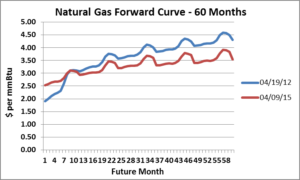 These five months represent the winter heating season, when demand for natural gas is historically the greatest and natural gas prices, correspondingly, are generally highest. With the rolling off of the November contract yesterday, the 2015/2016 winter strip closed out at $2.349 per mmBtu. The graph below puts this into perspective by comparing the current winter strip (in red) to that of previous winters. Incredible. These are days to remember. Concerns and worry about Peak Oil are overstated and irrelevant. Many articles and books have been written on the topic and many lectures given. Dire predictions have been made and many people have concluded that because of peaking of crude oil production, the future of the human race is bleak. Peak Oil theory seems so intuitive. There is a finite amount of oil contained within the crust of the earth. As the human population increases and the global middle class expands, we have used, and continue to use, more and more crude oil. The amount of crude oil remaining, therefore, dwindles with each passing day. Therefore, it is inevitable that crude oil production will peak and then begin to decline. As production declines, bad things will happen. The price of crude oil will certainly rise dramatically, and geopolitical conflict will develop over access to the remaining pool of crude oil. The good life that we live now will come to an end. As intuitive as this logic is, it has a large problem. It is flawed. Why? Because we live in a market economy and because technology keeps advancing. Crude oil is but one form of energy available to the human race. As the price of crude oil rises, exploration companies are incented to find more supply. 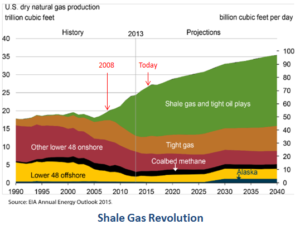 Shale oil reserves are developed. Also, substitutes to crude oil become more viable. Natural gas displaces fuel oil and also begins to be used more and more as a transportation fuel. Renewable energy sources become more economical. Energy markets adjust. Alternatives are found. Peak Oil theory focuses on the perceived inevitability of dwindling supplies of crude oil. What the theory ignores is the possibility of declining demand for crude oil. There are more and more indications that the demand for crude oil is slowing and will begin to decline. The energy intensity of our economy is declining as efficiency and productivity improvements permeate our homes and industry. The world population is becoming more urban, lessening the need for gasoline as a transportation fuel. Cars and trucks are more energy efficient. With crude oil supplies increasing and the demand for crude oil slowing, and likely to continue to slow more, demand for crude oil will peak long before dwindling supplies of crude oil become a concern. Fagan, Mary, “Sheikh Yamani predicts price crash as age of oil ends,” The Telegraph, June 25, 2000,http://www.telegraph.co.uk/news/uknews/1344832/Sheikh-Yamani-predicts-price-crash-as-age-of-oil-ends.html. Just about three years ago, on April 19, 2012, the prompt-month (see Note 1) natural gas futures contract closed at $1.91 per mmBtu, a twelve year low. On April 9, 2015, the prompt-month contract closed at $2.53 per mmBtu. 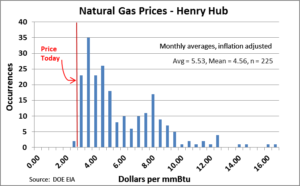 Are natural gas prices higher now, in April 2015, than they were in April 2012? The current prompt-month contract is certainly higher than the prompt-month contract was three years ago. In fact, it is 32.6% higher. 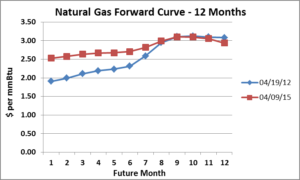 Looking at the 12 month futures-strip (see Note 2), the simple average price (see Note 3) of natural gas is 10.0% higher than it was three years ago. The simple average price of the 24 month strip is essentially unchanged. But, further into the future, prices are lower than they were three years ago—surprisingly so. The 36 month strip is 4.4% lower. The 60 month strip is 9.3% lower. The graph below shows the full term of the futures curves at the two points in time. The current curve is 13.4% lower. The current prompt-month contract is certainly higher than in April 2012. However, prices further out the futures curve have dropped significantly since. The current futures curve does not even approach $5/mmBtu over its life. The market expects natural gas prices to remain low for a long time. For energy consumers with natural gas load, this market represents a golden opportunity to lock in low prices. 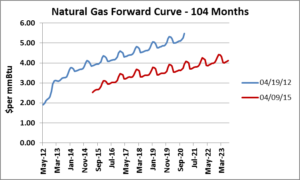 How long will this favorable natural gas market last? That is the subject of another article. Note 1 – The prompt-month contract, also known as the near-month contract, refers to the futures contract month that is closest to expiration. For example, during April 2015, the prompt-month contact was for delivery during May 2015. Note 2 – Futures-strip refers to futures contracts for two or more sequential delivery months. For example, the 12-month futures strip during April 2015 spans the months of May 2015 through April 2016. Note 3 – The simple average price of a futures-strip is just that, the simple average of all of the monthly prices in the strip. This is as opposed to a load weighted price in which each monthly price is weighted by the amount of load an energy buyer expects to use during each of the months in the futures-strip. Data from the US Department of Energy, Energy Information Administration and the Chicago Mercantile Exchange.